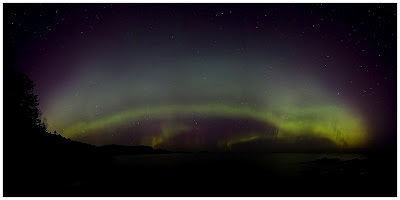 The Aurora display last night was one of the best I have ever seen. The light danced gracefully throughout the sky for hours. My girlfriend Robin and I stared in awe at the display while relaxing on a smooth rock surface near Wetmore Landing in Marquette, MI. I hope everyone enjoys this panorama of the Auroras. Technical details: Canon 7D, Canon 10-22mm lens (@12mm), ISO 400, F/3.5, 30 seconds, Five vertical shot panorama. Totally awesome, Julian. To see it is one experience, but to capture it on camera is really amazing!